Back at church today, one was caught between the enduring and the sacrifice, that being the story of Christ and the seemingly ordinary story of two men as depicted on plaques and memorial stones in the church. There is much to be said of both the magnificence and simplicity of Manchester Cathedral (Cathedral and Collegiate Church of St Mary, St Denys and St George in Manchester), its very accessible and welcoming nave and a message easy to the ear, the hearing and the soul. In the traditional church calendar, today marked the Presentation of Christ in the Temple, the hymns, the readings and the sermon followed this theme. The pamphlet contained everything, this time, not much of a fidget to follow the service. At Communion the openness of fellowship is most evident because members of all Christian Churches are invited to receive Communion, yet you can also step forward to just receive a blessing. By informing a steward before the service, you can also receive a gluten-free communion wafer. This time we did go High Church with incense at the altar, something the pamphlet informed us about, the pomp and ceremony at church can be quite engaging just as it is spiritual, I would suppose anytime I am in Manchester I would be revisiting my Anglican heritage and roots. 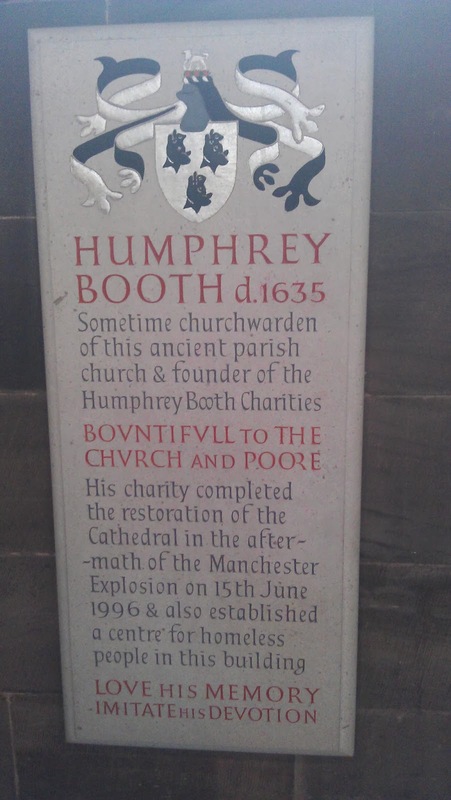 Humphrey Booth (d. 1635) was a wealthy merchant whose charitable activities are recorded on plaque in the church, but more significantly is that what he bequeathed to Manchester that helped in restoring the church in the aftermath of the Manchester explosion of the 15th of June 1996. I was in Manchester on that day, just 10 yards from where shards of glass fell on someone not long after I heard a loud bang and wondered until it occurred to me that it was a bomb. Had he expended his means on ostentatious and hedonistic living, it is unlikely that 366 years after his death any of his substance would have been so remembered and recorded in posterity as I have been able to observe. More on Humphrey Booth’s legacy – The Humphrey Booth Resource Centre. 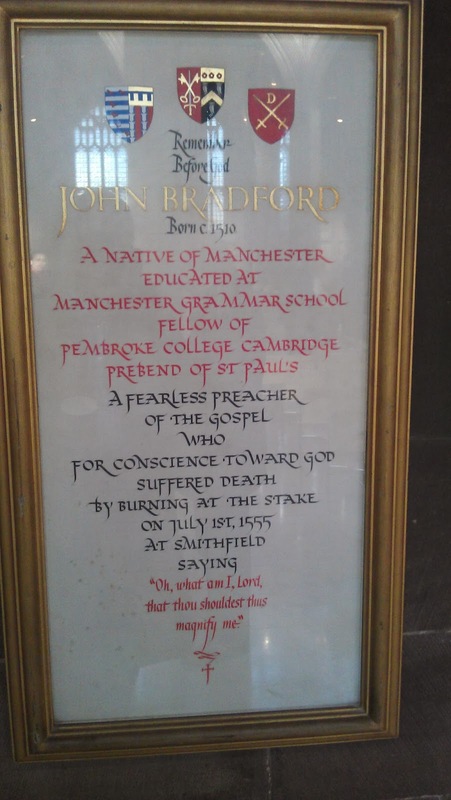 John Bradford (c. 1510 - 1555) of indeterminate birth date is memorialised with a plaque as a scholar, a reformer, a fearless preacher, a prebendary of St Paul’s Cathedral and was burnt at the stake for heresy. The heresy being as a Protestant he refused to revert to the Catholic faith that Mary Tudor (Bloody Mary) tried to restore in the land. English church history has it that the government feared the consequences of putting John Bradford to death, more significantly, the crowds did protest his burning at the stake. When I look at traditional Christianity and what passes for it today, especially amongst the leadership, one can only be moved by the stories of charity and sacrifice, charity that endures for centuries and sacrifice where those who suffer by reason of their faith see their suffering in the light of their innocence still count it great honour to so treated for their profession. One must stop and think, beyond which the search for Good Samaritan humanity that touches people continues in the church and on the streets.